Xiaomi has launched today budget smartphone, Redmi Go in India which runs on Google’s Android 8.1 Oreo (Go Edition) and comes pre-installed with apps like YouTube Go, Gmail Go, Google Assistant Go, Maps Go, etc. Google’s Android Go programme is specifically designed for budget smartphones. This phone will also run lite versions of some other popular apps like Facebook, Twitter, Uber, Ola, etc. This phone also comes with support for 20+ regional languages and also support for the Hindi language on the Google Assistant. Redmi Go comes in two colors of Blue and Black in plastic body with metallic finish. It is priced Rs. 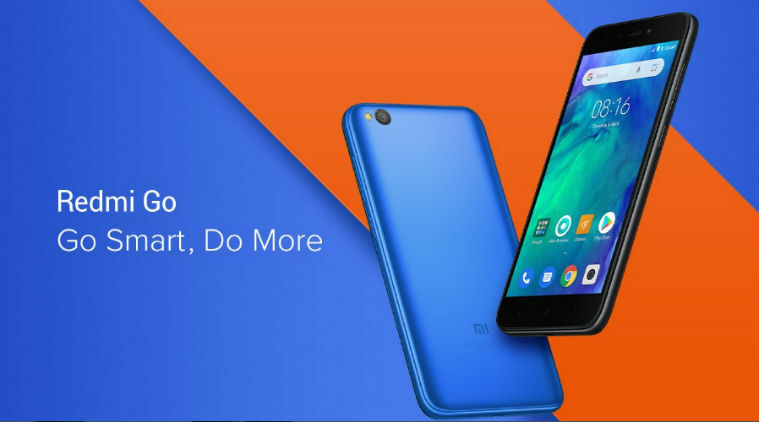 4499 and will go on sale from 22nd March on Mi.com, Mi Home, and Flipkart. Redmi Go features a 5 inch HD (720×1280 pixels) display with an aspect ratio of 16:9. It is powered by 1.4GHz Snapdragon 425 quad-core processor with Adreno 308 GPU. It has 1GB of RAM and 8GB of internal storage which can be further extended upto 128GB via microSD card. This is Dual SIM supporting phone and also has third dedicated slot for microSD card. This phone is packed with 3000mAh battery. This phone is equipped with an 8 MP rear camera with LED flash, f/2.0 aperture and 5MP camera at the front for selfies with f/2.2 aperture. It offers connectivity options of 4G LTE, Wi-Fi 802.11 b/g/n, Bluetooth 4.1 and GPS/ A-GPS.